A member of Terminus Traduction. 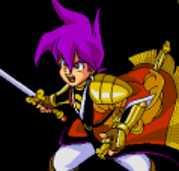 The avatar here from one French translations forum is of a character from the Tengai Makyou series (Possibly the PS2/GC edition of part 2: Manjimaru. ).